Digitoe began as the Dream of a Shoemaker in 1985. The journey from dream to materialization took many years to accomplish. Digitoe developed each piece of the technology in its own research facility in Port Townsend, Washington. With little or no outside financing available, Digitoe was forced to take the slow path of technical development. 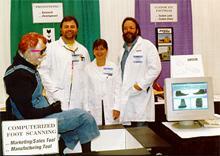 In 1995 Digitoe Custom Footwear Technology was finally working in reality. A team of people from Digitoe went to Boston to display the new creation and offer it to the American Shoe Industry at "Shoe Tech 95".
" 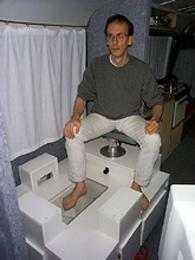 Shoe Tech 1995 "
By 1995 Digitoe had built the world's first successful Digital Foot Scanner, and perfected the technology for making Computer Generated Individual Shoe Lasts. Between 1995 and 1999 almost all of the remaining shoe manufacturing facilities in North America that were owned and managed by the major shoe companies had closed down, and they moved their production off shore. During this period from 1995 - 1999 Digitoe was growing and developing new technology for the future, while the rest of the shoe industry was melting down. The equipment from these shoe factories was sold off at auction prices to people from developing countries all over the world. Digitoe "Shoes for the 21st Century"  is more than just a trademark slogan... It is a statement of purpose & vision. Digitoe has since become the leading developer of Know-how and Technology for Customization of Footwear, in the "Global Village." Digitoe philosophy and concepts have been quoted and adopted by several major international companies in their Mass Customization projects. Digitoe Computerized Footwear Systems plans to continue to develop new technologies for the future and to commercialize their technology for the benefit of mankind. Perfect fitting footwear for everyone, can be a reality today with the Know-how and Technology developed by Digitoe. It will take time, capital resources, and people with vision to rebuild the shoe manufacturing industry in North America. We are looking for. &COPY; Copyright 1988-Present Digitoe Inc., All Rights Reserved.